When I came to the Kotel (Wailing Wall) about thirty-two years ago as a teenager newly graduated from high-school, the beauty of the golden Dome of the Rock attracted my eyes. I had just met a girl named Chava, from Diaspora Yeshiva, who was trying to mekarev me (bring me close to Torah). 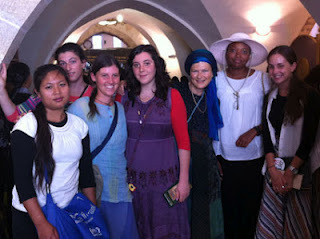 I remember that when I marveled at the beauty of the golden mosque to Chava, her response surprised me greatly. “Soon, the dome will be destroyed, and in its place will be built the most beautiful Temple for Hashem,” were Chava’s words. I couldn’t believe what she had just said, so softly and matter of factly. How could she know that this most gorgeous building, with inlaid stones of blue and gold, would be destroyed? And how could she be happy about this forthcoming destruction? I was appalled. Here, I came from the tolerant Denmark. I believed in the spirituality and rights of all people, and then my own religion again showed itself to be utterly narrow-minded and chauvinistic about its own rites, to the exclusion of everything which is beautiful and valuable to others. I had no idea of what the Temple represented in Judaism, and why it had been the major part of our prayer for thousands of years. I didn’t even know it was mentioned in our prayers at all. As I started to learn in Yeshiva, I still did not understand why we were mourning on Tisha B’Av. Over the years I gradually got an idea of what the Temple is all about. I hope through the meditation mentioned below, we can come closer to understand and imagine the splendor of the Feminine In-dwelling Presence returning to the world. May we merit to experience all our visualizations in actual reality! 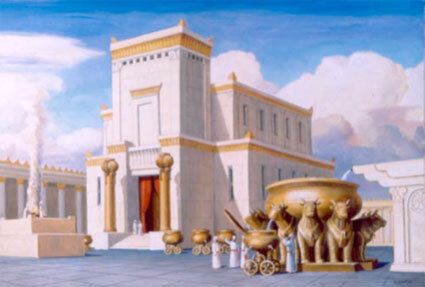 During the Shabbat before Tish’a B’Av, Hashem grants us a vision of the third Temple. Therefore, This Shabbat is called Shabbat Chazon – meaning the Shabbat of Vision. It is also named so, because our haftorah relates Yesha’yahu’s “Chazon” – vision of the destruction of Jerusalem. However, other shabbats are not named by the first word of their haftorah. Therefore, it makes sense that this Shabbat is named for the vision of the rebirth that is destined to follow the destruction of the Temple. The purpose of the vision is not just to comfort us, but to inspire us and elevate us to turn the vision of the Third Temple into physical reality. In our time, visualization – the ability to see mental images in your mind – has become a very popular tool, for attracting success and prosperity. When you visualize a new reality, you internalize it in a way that merely thinking or talking about it won't accomplish. It becomes something that you know, that you can relate to and understand. Rabbi Yochanan explained: It is written (Yirmiyah 30:17), “For I will restore health to you, and from your wounds I will heal you; this is the word of G-d. They called you an outcast, saying, ‘She is Tzion; none seek her.’” It says, ‘None seek her,’ from which we learn that she requires seeking. We are called to seek out, learn about, desire and visualize Tzion – our Holy Temple. This Shabbat when every Jewish soul receive a glimpse of our world as a Divine home – a place where all G-d’s creatures will experience His presence, is the prime time for seeking out Tzion, and imprint our super-conscious experience into our conscious awareness. Through our effort to visualize in our minds and meditate on what our soul is seeing, we have the ability to shift our energy and become empowered to realize our vision in actual reality. Rabbi Menachem Mendel Schneerson, the seventh Rebbe of Lubavitch emphasized the importance of meditating this Shabbat on a vision of a House which will fuse the upper and lower worlds, spiritual and physical reality, in permanent union. However, King Shlomo’s glorious Temple was destroyed on Tisha b’Av nearly two thousand years ago, and with it these pillars of faith. So was the promise of the pillars names of faith in vain? Were the names of promise for eternal establishment and strength deceiving? There must be a way to explain the eternal strength of these twin-pillars. Perhaps the everlasting power of Yachin and Boaz is engraved within our soul. Whenever the Temple would stand high in Jerusalem, these pillars had a physical expression, whereas during the two thousand years of exile, the spiritual energy of these pillars would continue to inspire every Jewish soul with vision and faith in the Temple’s forthcoming rebuilding. Sit down in a relaxing place and center yourself. Imagine inhaling Hashem’s life-giving light and exhaling tension, pressure and worry. 1. Keep breathing slowly while inhaling י –Y-a, exhaling כין – Chin four times, think about something strong establishment while you breathe. 2. Now change to inhaling בו – Bo, exhaling עז – As for four times, think about inner strength and endurance. 3. Try to visualize the two great copper pillars at the opening of the Temple, towering nine meters high – about four and a half times the height of a person. 4. Visualize the שושן – lily on top of each of the pillars with its six petals completing the pillars Yachin on the right side of the Temple gate and Boaz on the left. 5. Try to imagine the glow of the full moon connecting with Yachin on the right, and the power of the Sun connecting with Boaz on the left. 7. Take your time to imagine going through the gate, really visualize the small figure of yourself entering between the pillars of Yachin & Boaz. What do you experience? Try to imagine the visions/colors, sounds, feelings, smells and even the taste of the air. 8. Make a resolution. Promise yourself and Hashem to make a positive change in your life that will bring you closer to who you really want to be, and help you bring about the rebuilding of the Temple, both in your heart and in the world. Shabbat Chazon is greater than any other Shabbat of the year. “There was never a holiday for Israel like the day that the Temple was destroyed.” The reason can be understood in light of the Jewish law that a person is obligated to have relations with his wife before traveling on a journey. The last moment before Hashem’s Shechina (Indwelling presence) takes leave of Israel; there is a greater closeness and intimacy than ever. This time when Shabbat Chazon is on Tisha b'Av itself, this moment of closeness is even extended. Let us take advantage of this Shabbat to visualize all the true goodness for which we are yearning! Rabbi Levi Yitzchak of Berditchev, also quoted in the Tzemach Tzedek's notes to Eichah, Nach, Vol. II, p. 1097, in the footnotes. Except for Shabbat Nachamu, “the Shabbat of consolation” in the name of the first word of Haftorat V’etchanan. See Remez Sasson, Visualize and Achieve, . Rosh Beit Midrash, Zichron Dov Yeshiva University Torah Mitzion Beit Midrash of Toronto. Rebbe Avraham Yehoshua Heshel of Apta, Ohev Yisrael, Parashat Devarim. This is very beautiful, but technically, I don't think regular citizens ever entered between these two pillars which were in front of the entrance to the Heichal, an area for only Cohanim. May we all merit to see and understand all the intricate details of this amazing place in a physical sense. You are right about that, but that doesn't prevent us from imagining and vizualizing this other dimension of reality. 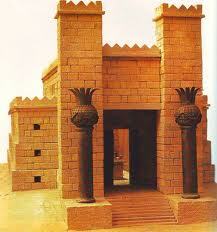 Perhaps on shabbat Chazon especially before the Temple will be rebuild we have the advantage of unlimited vision!